The ninth season of American Idol premiered on January 12, 2010 and concluded on May 26, 2010 on Fox. Simon Cowell, Randy Jackson and Kara DioGuardi returned to the judging panel. Ellen DeGeneres joined the panel as a replacement for Paula Abdul after guest judges filled in during the auditions. Idol Gives Back also returned for the season and was held on April 21, 2010, during the top seven results show. The top 24 semi-finals format used in the fourth through seventh seasons also returned this season. Cowell, DioGuardi and DeGeneres all left the show after this season ended, although only Cowell's departure was announced in advance. This was the second season where neither of the final 2 contestants had been in the bottom 2 or 3 prior to the finale, with the first being the seventh season. This was also the third consecutive season a male contestant had won, the longest streak for either gender. It was the first season since sixth season where a female made it to the finale and was also the first time since seventh season seven that both the finalists released a different song as a debut single. 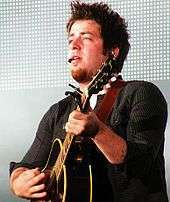 Lee DeWyze, a folk rocker from Mount Prospect, Illinois won the competition, beating the runner-up Crystal Bowersox. Eight contestants from this season were signed to record labels. The signed artists are Lee DeWyze, Crystal Bowersox, Casey James, Michael Lynche, Siobhan Magnus, Tim Urban, Didi Benami, and Lacey Brown. After the season began, Paula Abdul did not return to the judging panel, having announced in the beginning of August 2009 that she was leaving the show due to unresolved contract negotiations. Victoria Beckham, Mary J. Blige, Shania Twain, Katy Perry, Avril Lavigne, Joe Jonas, Neil Patrick Harris and Kristin Chenoweth were brought in to star as guest judges during the auditions phase. There was no guest judge on day two of the Orlando auditions because day one guest judge Chenoweth was called back to New York City. Therefore, Simon Cowell, Kara DioGuardi and Randy Jackson appeared with only three judges on the audition panel similar to the main panel from the first to the seventh season. After making the decision to utilize guest judges in Abdul's absence, Fox chairman Peter Rice stated that they would find a permanent fourth judge before the season premiere in January 2010, leading the confirmation on September 9, 2009 by Ellen DeGeneres that she would be joining the show as the new permanent fourth judge for the rounds held at CBS Television City for Hollywood Week and thereafter, onto the live shows. In addition, Simon Cowell announced shortly before the ninth season began that it would be his last season on American Idol. Cowell left the show to begin preparations for an American version of his talent show The X-Factor. Also, DeGeneres announced on July 29, 2010 that she would not return to the judging panel because it was not the right fit for her. DioGuardi would also not return as a judge for the tenth season as announced on September 3, 2010. After her departure, DioGuardi helped and nominated Steven Tyler for a role as a judge on season ten to show's producers. During this stage guest judges filled in the fourth judging seat. Beckham was the first guest judge, appearing for the Denver and Boston auditions. Blige served as a guest judge for the Atlanta auditions. Jonas filled the guest judging role on the first day of the Dallas auditions and Harris took over the role the following day. Chenoweth served as a guest judge on the first day of the Orlando auditions and Twain judged in Chicago. Perry judged on the first day of the Los Angeles and was replaced by Lavigne the following day. During the Atlanta auditions, 62-year-old activist Larry Platt appeared and performed his original song "Pants on the Ground." The song's lyrics criticize people wearing the hip-hop style of clothing including pants that sag. Well over the age limit of 28, Platt was ineligible to continue. His performance has since become a viral hit, and several celebrities performed the song in the days that followed the original airing of his audition in Atlanta. Held at the Kodak Theatre for the second straight year, the first day of Hollywood Week featured the 181 contestants from the auditions round (although only 172 contestants were listed on the American Idol website) singing solo with the option of playing an instrument. Ninety-six contestants advanced. The next round required the contestants to split up into groups and perform. Seventy-one advanced to the final round of Hollywood requiring a solo performance. Forty-six made it to the final round where the judges take contestants one by one and tell them if they made the final twenty-four. One of the singers who was eliminated at the final cut was Lauren Daigle. Ellen DeGeneres made her first appearance as a judge (replacing Paula Abdul) at this time. The first seven were revealed on February 16, 2010 (during the second hour on the episode), and the rest were revealed on the following night's episode. The semi-final format used through the fourth through seventh seasons was revived for this season. Starting with 12 women and 12 men, the women and men perform on weekly separate shows and on the result shows, the bottom 2 women and the bottom 2 men are eliminated from the competition. The semi-finals took place over three weeks until there are six women and six men forming the top 12. From this point on in the show, this season's exit song, "Leave Right Now" by Will Young, was played over eliminations. Note: The females were scheduled to go first, but medical issues with Crystal Bowersox, who was hospitalized on March 2 with complications from diabetes, required a switch. 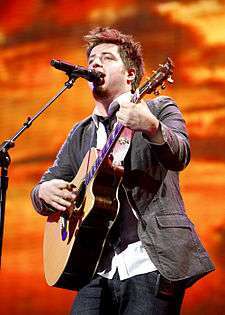 Lee DeWyze (born April 2, 1986 in Mount Prospect, Illinois, 23 years at the start of the show) is from Mount Prospect, Illinois and auditioned in Chicago, Illinois with Bill Withers' Ain't No Sunshine. He performed The Fray's "You Found Me" during Hollywood week. Prior to his appearance on American Idol, he had worked in various jobs, including as a paint salesman and a trading floor clerk at the Chicago Mercantile Exchange. He also appeared as an actor in a short low-budget film 'Deadscapes: Broken Road.' When he was 17, he was signed to Wuli Records and had released two CDs – So I'm Told and Slumberland. He was declared the winner on May 26. He was signed to RCA Records after the competition and released an album Live It Up on November 16, 2010. Crystal Bowersox (born August 4, 1985 in Elliston, Ohio, 24 years at the time of the show) is from Elliston, Ohio and auditioned in Chicago, Illinois with Erma Franklin's Piece of My Heart. She auditioned for Idol to try to make a better life for her son. Her Hollywood performance of Aretha Franklin's "(You Make Me Feel Like) A Natural Woman" impressed the judges and fellow contestants alike. She had performed as a singer from the age of 10 and moved to Chicago aged 17, frequently working as a busker at train stations there. She was diagnosed with Type 1 diabetes when she was six, and while on the show, she suffered diabetic complication and was hospitalized which resulted in the Top 20 performance nights for the male and female contestants being switched. She became the runner-up and was signed to Jive Records. 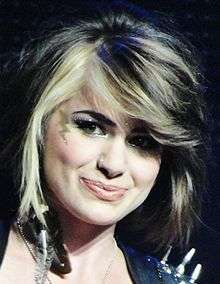 Her debut album Farmer's Daughter was released on December 14, 2010. Casey James (born May 31, 1982 in Princeton, Texas, 27 years at the time of the show) is from Fort Worth, Texas and auditioned in Denver, Colorado with John Mayer's "Slow Dancing in a Burning Room". He performed professionally after finishing school, but suffered a serious motorcycle accident when he was 21. He took his shirt off during audition after prompting from Kara DioGuardi and Randy Jackson, and Kara's interest in him became a recurring joke in the season. He is an accomplished guitarist and demonstrated his skill with his Hollywood round performance of Ray Charles's "I Don't Need No Doctor" and Top 20 performance of Gavin DeGraw's "I Don't Want to Be." He had never previously watched the show before he auditioned. He was eliminated as a third-place finisher on May 19. He was signed to Sony Music Nashville after the show. Michael Lynche (born May 31, 1983, 26 years at the time of the show) is from St. Petersburg, Florida auditioned in Orlando, Florida with Todd Duncan' "Unchained Melody". He worked as personal trainer prior to Idol. His is married and his daughter was born during Hollywood round, and the unfolding drama of his wife's labor was heavily featured during the Hollywood round where he performed John Mayer's "Waiting on the World to Change". He was saved by the judges when he became the lowest vote-getter on April 7, 2010, but finally he was eliminated at fourth place on May 12. Aaron Kelly (born April 2, 1993 in Davenport, Florida, 16 years old at the start of the show) is from Sonestown, Pennsylvania and auditioned in Orlando, Florida as a winner from American Idol Experience at Disney's Hollywood Studios. His audition song was Miley Cyrus's "The Climb", and performed Sarah McLachlan's "Angel" during the Hollywood rounds but forgot his words. He was adopted by his aunt and uncle at 5. He had performed from a young age, and was a finalist on PAX-TV's America's Most Talented Kid at the age of 11. 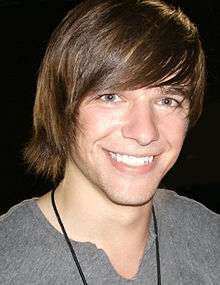 He was in 2010 the youngest American Idol contestant to reach Top 12. He was eliminated at fifth place on May 5. Siobhan Magnus (born March 15, 1990 in Barnstable, Massachusetts, 19 years at the start of the show) is from Cape Cod, Massachusetts and auditioned in Boston, Massachusetts with Queen's "Love of My Life". Before Idol she performed as the lead vocalist of her band, Lunar Valve, and she worked as a glassblower in Hyannis, Massachusetts. She performed Stevie Wonder's "Living for the City" in the Hollywood rounds. She was noted in the show for her ability to sustain a long high-pitched note. She was eliminated as sixth-placed finisher on April 28. Tim Urban (born May 1, 1989 in Tacoma, Washington, 20 years at the time of the show) is from Duncanville, Texas and auditioned in Dallas, Texas with Matt Nathanson's Bulletproof Week. He performed David Cook's Come Back To Me during the Hollywood round. He did not qualify initially for the semi-finals but was chosen as a replacement for Chris Golightly who was disqualified for having a prior record deal. He finished at seventh place on April 21. Katie Stevens (born December 8, 1992 in Southbury, Connecticut, 17 years at the time of the show) is from Middlebury, Connecticut auditioned in Boston, Massachusetts with Glenn Miller's At Last. She looked after her Portuguese grandmother who suffered from Alzheimer's disease, and she is fluent in Portuguese. She performed Jean DuShon's "For Once in My Life" in the Hollywood rounds where Kara DioGuardi considered her a possible season's winner. She finished eighth place on April 14 in a double elimination, due to judges' save being used the previous week. 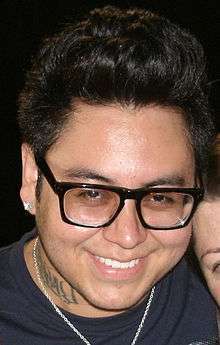 Andrew Garcia (born October 8, 1985 in Moreno Valley, California, 24 years at the time of the show) auditioned in Los Angeles with Maroon 5's "Sunday Morning". He had a good sized following on YouTube prior to auditioning on Idol. He impressed the judges with his performance of Paula Abdul's "Straight Up" during the Hollywood rounds, but failed to interest the judges in the later rounds. He was eliminated as joint eighth-place finishers together with Katie Stevens on April 14. Didi Benami (born October 25, 1986 in New York, 23 years at the time of the show) is from Knoxville, Tennessee and currently resides in Hollywood. She auditioned in Los Angeles, California with The Beatles' "Hey Jude". She was inspired to audition by her best friend who died in a traffic accident. She was notable during the Hollywood rounds for her performance of Kara DioGuardi-penned Katharine McPhee's song "Terrified." She finished tenth after being eliminated on March 31. Paige Miles (born September 26, 1985, 24 years at the time of the show) is from Naples, Florida and auditioned in Dallas, Texas. She was eliminated in eleventh place on March 24, 2010. She performed Stevie Wonder's "Living for the City" in the Hollywood rounds which she considered her favorite moment prior the semi-final. Simon Cowell considered her to have the best voice among the girls. Lacey Brown (born August 13, 1985, 24 years at the time of the show) is from Amarillo, Texas and auditioned in Orlando, Florida with Judy Garland's "Over the Rainbow". She had previously made it to the Hollywood round in the eighth season of American Idol but lost out to Megan Joy at Top 50. Ryan Seacrest noted that her chilling performance of "What a Wonderful World" by Louie Armstrong had a major part in her advancing into the Top 24. She was the first finalist to be voted off on March 17. As in the eighth season, the judges were given one save that they could use before the top 5 week. They used the save for Michael Lynche during top 9 week. "Leave Right Now" by Will Young was used as the send-off song when a contestant was eliminated. Top 11: "Wake Me Up Before You Go-Go" by Wham! Top 6 Girls feat. Christina Aguilera: "Beautiful" / "Fighter"
Top 7 Alicia Keys "Un-Thinkable (I'm Ready)"
Since the seventh season, the voting results are seemingly skewed towards Caucasian contestants, and critics believe that it was Caucasian female viewers who vote only for Caucasian male contestants. During top 20 week, all four eliminated contestants were non-Caucasian. This season had the fewest non-Caucasian finalists. This led to criticism of bias in favor of Caucasians. Chris Golightly was originally selected as semi-finalist. According to reports, Golightly was disqualified on February 17, 2010, after already being told he was in the top 24, over an old contract. The contract had expired by the time the top 24 began to tape, but they disqualified him because he was under contract at the time of the tryouts, in violation of Idol rules. He was later replaced by Tim Urban at the last minute of the last part of Hollywood Week. Golightly later appears on a Korean television show called Superstar K, a singing competition similar to the American Idol. In there, he tells that he also used to write songs for Korean singers, such as Jewelry, DBSK and ZE:A. The semi-final eliminations of early favorites Alex Lambert, Katelyn Epperly and Lilly Scott before the Top 12 stunned bloggers and viewers. Michael Slezak of ew.com stated, "So you'd think by season 9 — during the inconsequential semifinals, no less — it would be easy to brush off the bad judgment of speed-texting tweens, to process the way-too-early exits of Lilly Scott, Katelyn Epperly, and Alex Lambert...and move on...(S)o why do the ritual killings of the dreams of (three) indisputably flawed semifinalists feel like they’re part of something bigger, a shifting of the tectonic plates at the core of the Idol universe?" Lacey Brown's elimination stirred up controversy after Ryan Seacrest tweeted the results before the elimination aired on the west coast. This caused anger among the fans of the show and as a result, the elimination show may have had lower ratings than usual. Seacrest has been criticized by The Wrap and MSNBC Entertainment contributors for "critiquing the judges’ comments" and becoming more aggressive. Ratings for this season have dropped significantly compared to the prior two seasons leading to speculation that its run as the number one show on television may be coming to a close. Reasons for the decline have ranged from the smaller role and pending departure of Simon Cowell to the more unpredictable behavior of Ryan Seacrest. It was also claimed that Crystal Bowersox had considered Ryan Seacrest to have betrayed her. After it was reported that she had doubts about staying on in the show but Ryan Seacrest had talked her out of it, her fellow contestant Katelyn Epperly revealed that Crystal texted: "I'm fine...betrayed by Seacrest!" in a text message to her. Crystal denied that she was planning to leave, and there was no evidence that Ryan Seacrest had leaked the information himself. This season of American Idol was the top show for the 2009–10 season of broadcast primetime shows. Its Tuesday and Wednesday episodes occupied the top two spots of the season. Viewership for the Tuesday episodes averaged 22.974 million, while the Wednesday episodes averaged 21.951 million. Tori Kelly, who originally auditioned in Denver and was cut in the green mile round in this season of American Idol, appeared in Star Search and America's Most Talented Kid. Semi-finalist John Park, in 2010, finished second place in the second season of the Korean version of American Idol, Superstar K. This makes him to become one of two contestants to appear on this show from this season with Chris Golightly appeareing in the third season. ↑ Due to the judges using their one save, in order to save Michael Lynche, the Top 9 remained intact for another week. ↑ The bottom two were eliminated on April 14. The other member of the bottom three was never identified, though Seacrest made a point of indicating that previously-saved Michael Lynche was not the other member. ↑ The other member of the Bottom 2 was never announced, despite Crystal Bowersox was the last contestant to be named safe. ↑ Lee DeWyze was named safe first, then Crystal Bowersox. ↑ Kris Allen's rendition of "Let It Be" was made available on iTunes for download, with all proceeds going to Haiti charities. ↑ Will Young performed at the end of the performance show on May 25, 2010. ↑ The group that sang Delta Goodrem's "Together We Are One" consisted of many previous American Idol contestants, including winners Kelly Clarkson, Ruben Studdard, Fantasia Barrino, Carrie Underwood, Jordin Sparks, Taylor Hicks, and Kris Allen. ↑ Kate Stanhope. "Fox Lines Up Midseason Premieres". TVGuide.com. ↑ Mitchell, Wendy (October 6, 2009). "'Idol Gives Back' will return to 'American Idol' on April 21". EW.com. Archived from the original on January 5, 2010. Retrieved January 21, 2010. 1 2 Michael Slezak (December 22, 2009). "'American Idol' season 9: 24 semifinalists, no 'Wild Card' round, and a February 23 voting kickoff". EW.com. Archived from the original on January 14, 2010. Retrieved January 2, 2010. ↑ "Simon Cowell Leaving American Idol". People Magazine. January 11, 2010. Retrieved October 26, 2010. ↑ Barrett, Annie (September 3, 2010). "Kara DioGuardi not returning to 'American Idol': It's (finally) official". Entertainment Weekly. Retrieved April 19, 2012. ↑ "Ellen DeGeneres Bows Out of American Idol". Tvwatch.people.com. July 29, 2010. Retrieved April 19, 2012. ↑ Wyatt, Edward (August 5, 2009). "Abdul Walks Off Television's Biggest Stage". The New York Times. ↑ ""American Idol": Shania Twain will be the next guest judge.". EW.com. Retrieved August 17, 2009. ↑ "Mary J. Blige to Be a Guest Judge on American Idol". People. August 14, 2009. Retrieved January 21, 2010. ↑ "Neil Patrick Harris signs on to guest judge 'American Idol'". LA Times. August 25, 2009. Retrieved January 21, 2010. ↑ "American Idol's Next Guest Judge Revealed". People. August 27, 2009. Retrieved January 21, 2010. ↑ Ausiello, Michael (August 6, 2009). "Press Tour Diary: Katy Perry, Posh Spice to (temporarily) replace Abdul on 'Idol'". EW.com. Retrieved January 21, 2010. ↑ "Ellen DeGeneres Joins American Idol as Fourth Judge". Americanidol.com. September 9, 2009. Retrieved January 21, 2010. ↑ Daniel Kreps. "Simon Cowell Near New Deal to Stay On "Idol," Import "X Factor" : Rolling Stone : Rock and Roll Daily". Rolling Stone. Archived from the original on January 5, 2010. Retrieved January 21, 2010. ↑ "Season 9 Auditions – American Idol News". Americanidol.com. June 3, 2009. Retrieved January 21, 2010. ↑ "'So why did you turn down the Spice Girls? ': Victoria Beckham grills Simon Cowell as she joins American Idol". Daily Mail. London. August 11, 2009. Retrieved August 19, 2009. ↑ Release says Boston; arena is actually in Foxborough. ↑ Baltrusis, Sam (August 13, 2009). "Fox's 'American Idol' returns to Boston this week". Loadedgunboston.com. Retrieved April 19, 2012. ↑ Richard Eldredge (January 14, 2010). ""American Idol" auditions hit Atlanta, Leaving Our Jaws, Pants on Ground". Atlantamagazine.com. Retrieved April 19, 2012. ↑ "At Chicago auditions, Shania is an 'American Idol' diva in Twaining". Oocities.org. September 2, 2009. Retrieved April 19, 2012. ↑ Release says Los Angeles; arena is actually in Pasadena. Though its part of Los Angeles metropolitan area. ↑ "A Starring Role for the Marina Del Rey Marriott". News.marriott.com. February 12, 2010. Retrieved April 19, 2012. ↑ Release says Dallas; arena is actually in Arlington. Though its part of Dallas metropolitan area. ↑ "Neil Patrick Harris is your latest 'American Idol' guest judge". Blog.zap2it.com. Retrieved April 19, 2012. 1 2 "Joe Jonas meets Brewer High teens before first day of classes". Disneychannel-tv.com. February 22, 1999. Archived from the original on April 26, 2012. Retrieved April 19, 2012. ↑ American Idol in Denver – Photo Gallery Archived February 10, 2010, at the Wayback Machine. ↑ Payne, Bob (February 8, 2010). ""American Idol" hopeful from Seattle did not make it to Hollywood afterall". The Seattle Times. Archived from the original on February 12, 2010. Retrieved February 10, 2010. ↑ "Top 24 Revealed: Feb 17, 2010". American Idol. Retrieved November 17, 2014. ↑ "TOP 24 CONTESTANTS". American Idol. Archived from the original on February 22, 2010. Retrieved March 10, 2010. ↑ Byrne, Katie (February 25, 2010). "'American Idol' Reveals New Exit Song: 'Leave Right Now'". MTV. Retrieved April 28, 2010. ↑ Doris Dickson says: (May 28, 2010). "Despite American Idol Loss, Bowersox a Boon for Diabetes Awareness". Diabetesnewshound.com. Retrieved February 24, 2011. ↑ Although the American Idol website lists Siobhan Magnus' hometown as Cape Cod, Massachusetts. Siobhan is specifically from Marstons Mills, Massachusetts, a village in the town of Barnstable, Massachusetts within Cape Cod, Massachusetts. "'American Idol' worship at Barnstable High". CapeCodOnline.com. March 13, 2010. Archived from the original on March 15, 2010. Retrieved March 16, 2010. ↑ "American Idol Gives Back – Keeping The Dream Alive – Top Contestants Perform". YouTube. Retrieved June 5, 2010. ↑ Reiher, Andrea (March 5, 2010). "'American Idol' Top 20 week in review: Teen girl dreams and ethnic cleansing". Zap2it. Retrieved April 24, 2011. ↑ Kaufman, Gil (February 18, 2010). "Chris Golightly Disqualified From 'American Idol' Top 24". MTV. Archived from the original on March 25, 2010. Retrieved February 8, 2010. 1 2 김, 현지 (September 3, 2011). "슈퍼스타K3 크리스, 한국노래도 수준급 '샤이니 헬로' 완벽소화". "씨티신문 (City Daily)". Retrieved September 3, 2011. ↑ Slezak, Michael. http://www.ew.com/recap/american-idol-recap-season-9-episode-21. "The Unbearable Triteness of Leaving." March 10, 2010. ↑ Ryan Seacrest spoiler ignites Twitter revolt March 18, 2010 The Los Angeles Times. ↑ "'Idol's' problem isn't Ellen anymore – it's Ryan". MSN. Archived from the original on April 21, 2010. Retrieved June 5, 2010. ↑ "Forget Simon — 'Idol's' all about Ryan now". MSN. Archived from the original on April 20, 2010. Retrieved June 5, 2010. ↑ "American Idol" Ratings Down, but Ad Sales Seen Up". USA: ABC. Retrieved April 19, 2012. ↑ ‘American Idol’ Ratings Hit a Low Mark"
↑ Bianco, Robert (May 5, 2010). "It's time for producers to fix 'American Idol,' and here's how". USA Today. Retrieved April 19, 2012. 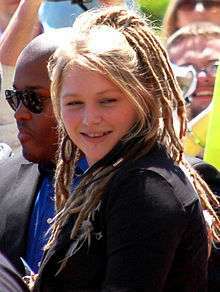 ↑ "'Idol' Contestant Crystal Bowersox Claims She Was 'Betrayed' by Ryan Seacrest". Fox News. April 7, 2010. Retrieved April 19, 2012. ↑ "'American Idol' Front-Runner Almost Quit". Tmz.com. April 16, 2010. Retrieved April 19, 2012. ↑ "Final 2009–10 Broadcast Primetime Show Average Viewership". Tvbythenumbers.zap2it.com. June 16, 2010. Retrieved April 19, 2012. 1 2 "tvbythenumbers Jan 20, 2010". Tvbythenumbers.zap2it.com. Retrieved April 19, 2012. 1 2 "tvbythenumbers Jan 26, 2010". Tvbythenumbers.zap2it.com. Retrieved April 19, 2012. 1 2 "tvbythenumbers Feb 2, 2010". Tvbythenumbers.zap2it.com. Retrieved April 19, 2012. 1 2 "tvbythenumbers Feb 9, 2010". Tvbythenumbers.zap2it.com. Retrieved April 19, 2012. ↑ "Listings – AMERICAN IDOL on FOX". The Futon Critic. Retrieved January 21, 2010. 1 2 "tvbythenumbers Feb 17, 2010". Tvbythenumbers.zap2it.com. Retrieved April 19, 2012. 1 2 "tvbythenumbers Feb 23, 2010". Tvbythenumbers.zap2it.com. Retrieved April 19, 2012. 1 2 3 "tvbythenumbers March 2, 2010". Tvbythenumbers.zap2it.com. Retrieved April 19, 2012. 1 2 3 "TV Ratings Top 25: Oscars, American Idol & The Big Bang Theory Top Weekly Broadcast Charts". Tvbythenumbers.zap2it.com. Retrieved April 19, 2012. 1 2 3 "TV Ratings Top 25: American Idol, Big Bang Theory, NCIS Top Weekly Broadcast Charts". Tvbythenumbers.zap2it.com. Retrieved April 19, 2012. ↑ "TV Ratings Top 25: American Idol, NCIS, Undercover Boss, House Top Weekly Broadcast Charts". Tvbythenumbers.zap2it.com. Retrieved April 19, 2012. ↑ Seidman, Robert (March 18, 2010). "Wednesday Broadcast Finals: "Ugly Betty, Gary Unmarried" Inch Up". TV by the Numbers. Retrieved May 25, 2010. ↑ Gorman, Bill (March 24, 2010). "Tuesday Finals: Lost, American Idol Up; V Clip Show Falls". TV by the Numbers. Retrieved May 25, 2010. ↑ Seidman, Robert (March 25, 2010). "Broadcast Finals: The Middle, Modern Family, Idol, Survivor, ANTM Rise". TV by the Numbers. Retrieved May 25, 2010. ↑ Seidman, Robert (April 6, 2010). "TV Ratings Top 25: Dancing; "Idol" & "Lost" Top Weekly Broadcast Charts". TV by the Numbers. Retrieved April 1, 2010. ↑ Seidman, Robert (March 31, 2010). ""The Middle," "Modern Family," and "American Idol" Rise In Wednesday Broadcast Finals". TV by the Numbers. Archived from the original on April 3, 2010. Retrieved April 1, 2010. ↑ Seidman, Robert (April 7, 2010). "Broadcast Finals: "Lost," "NCIS," "NCIS: LA" Tick Up; "V," "The Good Wife" Tick Down". TV by the Numbers. Archived from the original on April 12, 2010. Retrieved May 25, 2010. ↑ Seidman, Robert (April 8, 2010). "Wednesday Finals: "CSI: NY" Dips Further + "South Park," "In Plain Sight" and More". TV by the Numbers. Archived from the original on April 14, 2010. Retrieved May 25, 2010. ↑ Gorman, Bill (April 14, 2010). "Broadcast Finals Tuesday: Dancing, Lost Adjusted Up; V Adjusted Down". TV by the Numbers. Archived from the original on April 20, 2010. Retrieved May 25, 2010. ↑ Gorman, Bill (April 15, 2010). "Wednesday Broadcast Finals: The Middle, Modern Family, Cougar Town Adjusted Up; Ugly Betty Down". TV by the Numbers. Archived from the original on April 21, 2010. Retrieved May 25, 2010. ↑ Gorman, Bill (April 21, 2010). "Broadcast Finals Tuesday: Lost, Idol Adjusted Up; Glee, V Adjusted Down". TV by the Numbers. Archived from the original on April 27, 2010. Retrieved May 25, 2010. ↑ Gorman, Bill (April 22, 2010). "Wednesday Broadcast Finals: Idol, L&O: SVU Adjusted Up; Accidentally On Purpose Down". TV by the Numbers. Archived from the original on April 28, 2010. Retrieved May 25, 2010. ↑ Gorman, Bill (April 28, 2010). "Broadcast Finals Tuesday: Idol, Dancing, NCIS Adjusted Up; Glee Adjusted Down". TV by the Numbers. Archived from the original on May 4, 2010. Retrieved May 25, 2010. ↑ Gorman, Bill (April 29, 2010). "Wednesday Broadcast Finals: Modern Family, American Idol, Top Model Adjusted Up; High Society Down". TV by the Numbers. Archived from the original on May 6, 2010. Retrieved May 25, 2010. ↑ Gorman, Bill (May 5, 2010). "Broadcast Finals Tuesday: Idol, Lost, 90210 Adjusted Up; Good Wife, V, Parenthood Adjusted Down". TV by the Numbers. Archived from the original on May 11, 2010. Retrieved May 25, 2010. ↑ Seidman, Robert (May 6, 2010). "Wednesday Finals: "American Idol," "The Middle," "Modern Family," "Cougar Town" and "CSI: NY" Adjusted Up". TV by the Numbers. Archived from the original on May 10, 2010. Retrieved May 25, 2010. ↑ Seidman, Robert (May 12, 2010). "Tuesday Finals: Lost, NCIS Adjusted Up; Good Wife, V, Glee Adjusted Down". TV by the Numbers. Archived from the original on May 16, 2010. Retrieved May 25, 2010. ↑ Gorman, Bill (May 13, 2010). "Wednesday Finals: American Idol, Modern Family, Cougar Town Adjusted Up; Old Christine, Happy Town Adjusted Down". TV by the Numbers. Archived from the original on May 16, 2010. Retrieved May 25, 2010. 1 2 "TV Ratings Top 25: Dancing Tops Idol With Viewers Again, Lost Finale Wins With Adults 18–49". Tvbythenumbers.zap2it.com. Retrieved April 19, 2012. 1 2 "TV Ratings Top 25: American Idol, Big Bang Theory, Two And A Half Men Top 18–49 Ratings". Tvbythenumbers.zap2it.com. Retrieved April 19, 2012. ↑ "American Idol‘s Top 24 Revealed!". People. February 18, 2010. Retrieved January 28, 2015. ↑ "John Park finishes second in 'Superstar K'". The Daily Northwestern. Retrieved September 4, 2011.